Duvalia polita, commonly known as the polished star, was first described by N.E. Brown. The photos (originals: close-up and habit) were taken last month by Bart Wursten (aka zimbart@Flickr) on a recent trip through Zvishavane and Bulawayo in Zimbabwe. Bart encountered many of these small plants–thanks for sharing, Bart! Fleshy-stemmed, Duvalia polita is a succulent member of the Apocynaceae. 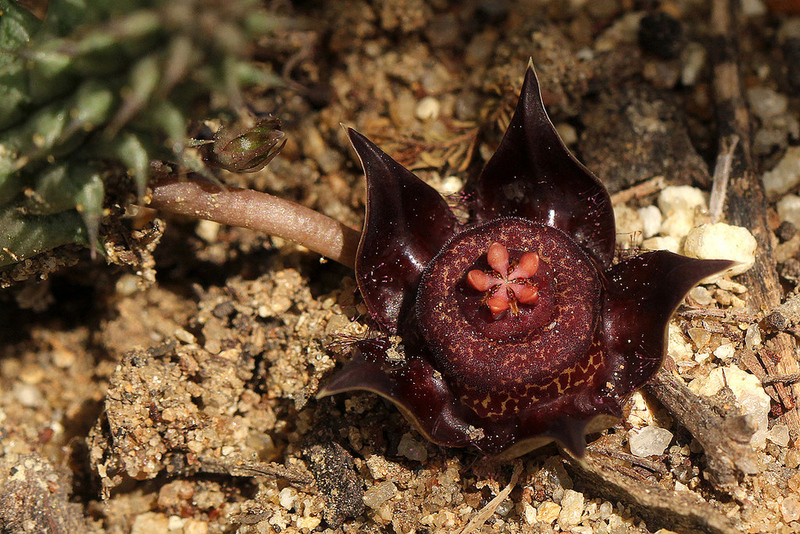 Dogbane family members with this morphology form a group collectively known as the stapeliads. Stapeliads are found exclusively in the Old World in semi-arid to arid areas. Duvalia polita itself is native to dry regions of southern Africa. Plants form clumps among trees or low bushes; the species is often associated with Colophospermum mopane woodland. The polished star is a small species, with its succulent stem rarely exceeding 10cm in height. Slender leaf-rudiments are held on the stem, but these quickly dry out and wear off. The inflorescence sits near the base of the stem. Green on the outside, the corolla is shiny and purple-brown on the interior, with a lighter annulus mottled with cream. The inner and outer corona lobes surround the gynostegium (the collective term for the staminal column and style head). Within the gynostegium are two carpels, each with unilocular ovaries but with one common style. The five guide rails are the receptive structures for the pollen and are distributed around the style head. The pollen is massed in pollinia, which join to form pollinaria. Five of these also surround the style head. 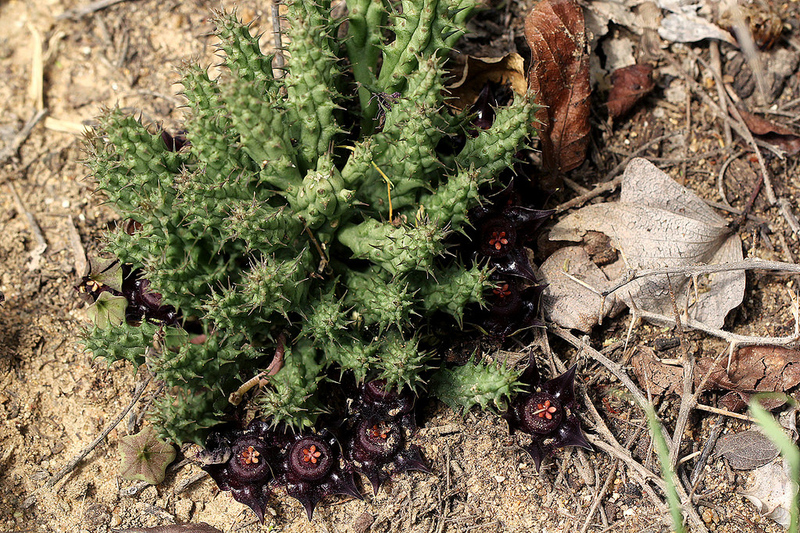 According to Peter V. Bruyns in volume I of Stapeliads of Southern Africa and Madagascar (2005), these deceivingly complex flowers attract flies as pollinators (a carrion scent is given off by the corolla lobes and annulus). Scurrying around on the corolla, a fly will potentially catch a leg or its proboscis in the guide-rail and then further into the corpuscle of the flower. In attempting to free itself, the fly will often remove a pollinarium. After dislodging itself, the fly might make its way to another flower and repeat the process. This time, though, the pollinia may connect to the guide-rail and be secured by the insertion-crest of the pollinia. When the fly tries to jerk itself away, the pollinia will remain stuck to the guide-rail, leaving the pollinarium adhered to the fly. The nectar behind the guide-rail stimulates pollen germination and the tube grows through the insertion-crest and into the style head. With little success, I tried to find a good diagram of stapeliad floral morphology for a better understanding of the pollination process. Instead, I offer a book preview of the Illustrated Handbook of Succulent Plants: Asclepiadaceae, by Albers and Meve, where on pages 5 and 6 a couple of illustrations may be of help! Wow, nature is so imaginative! Great photos and interesting write-up. Thanks. Played my usual game of trying to guess things about this plant before I read the post. Got the carrion scented (it just looks it), but completely missed the Apocynaceae connection. Thanks one more time for challenging and teaching me about our wide world of plants. I had taken few photos of a similar plants as a garden plant in North Cyprus. Like this plant Duvalia politia, it was very interesting for me. How can I send you a picture of this plant? Ihsan, see the link to the garden’s forums under the Leave a Comment section. We have a very well-trafficked plant identification forum, with excellent people from around the world contributing.